Black Aluminium CD/DVD hard storage case with individual plastic protective wallets to keep your collection of discs in pristine condition. Keys included for added security. Holds up to 240 discs. 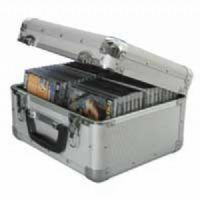 Silver Aluminium CD/DVD hard storage case with individual plastic protective wallets to keep your collection of discs in pristine condition. Keys included for added security. Holds up to 240 discs. A stylish CD/DVD wallet with imitation leather finish. Included are 25 pages of wallets which will hold up to 200 CDs, each page has 8 plastic wallets with fabric lining to protect your CDs, and safety lip to prevent the CDs from falling out. 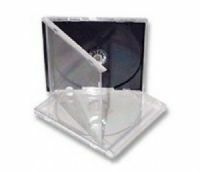 The pages are secured with a metal three ring binder allowing quick and easy removal when sorting your CD collection. A stylish CD/DVD wallet with imitation leather finish. Included are 24 pages of wallets which will hold up to 96 CDs, each page has 4 plastic wallets with fabric lining to protect your CDs and safety lip to prevent the CDs from falling out. The pages are secured with a metal three ring binder allowing quick and easy removal when sorting your CD collection. 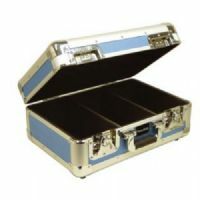 A robust aluminium flight cases for storage of CDs. The case features internal padding, with separators for the CDs. 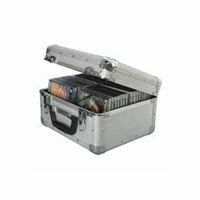 ALUMINIUM CD FLIGHT CASE Holds 120 CDs. A very high quality CD 70 case. Unit has a lift off lid with soft lining for protection. Made from high grade materials and finished in blue. TDK CD DISC WALLET WITH BUILT IN PORTABLE SPEAKER. TDK presents the CD wallet that holds 12 discs, an audio player of yours and plays music. Connects to portable music devices, stereos and notebooks as well.